Many manufacturers fight to take the very important spot of power supply when it comes to powering your all star rig, many with aspirations far beyond their means. 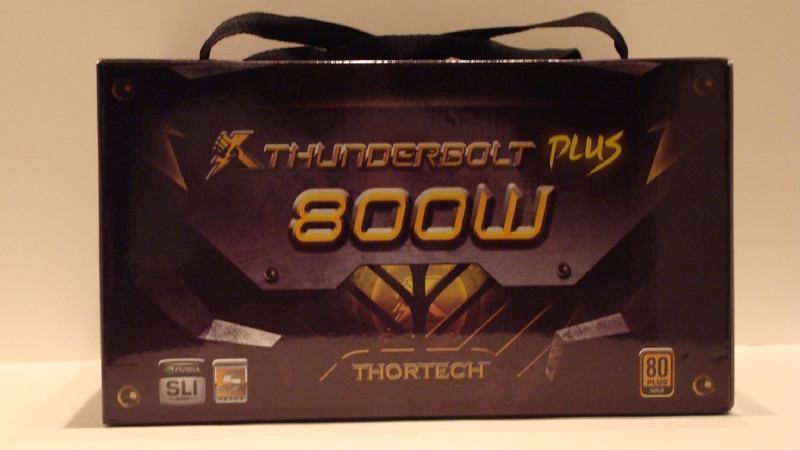 A relativity new company Thortech has decided to invoke the god of thunder in an attempt to blast its way into our hearts with its Thunderbolt Plus line of power supplies. Thortech isn’t truly a new company in the traditional sense it is instead a division of GeiL a high end memory maker. The Thunderbolt plus power supplies come in a just one size currently, the 800w monster that I will be reviewing. The Thunderbolt Plus 800w hopes to set itself apart from the crowd by coming as modular power supply with a unique addition that I will go over further in the review. Join me while I determine whether the Thunderbolt Plus 800w is a spark of genius or a burn out. I will be testing against a variety of loads in order to determine stability and noise output of the Thortech Thunderbolt 800w power supply. I it is extremely important that your power supply generates a consistent amount of power for all your internal components, if the power does not remain constant than you can and probably will experience a host of issues from device failure to fire. Front side of the retail packaging... and yes those are handles on the box. 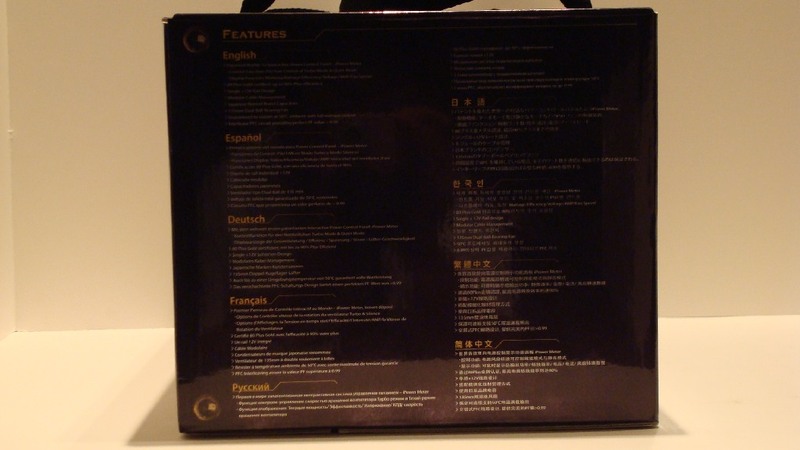 Back of the box with product specifications and a picture reference of the included cables. 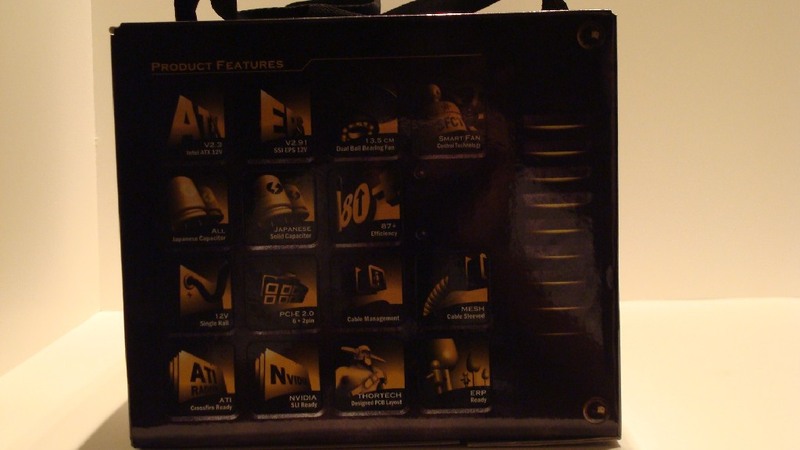 As you notice from the pictures the box is quite flashy while still containing a good amount of information. The bonus to the Thunderbolt plus is that the box could theoretically double as a tote for cables to your next LAN party. The side of the box contains product features in over sized icons denoting things like its ATX standard, Japanese solid capacitors, and its 87+ efficiency. The final side just has a text listing of the features seen on the opposite side, this listing does have the added benefit of being in multiple languages. The features list is impressive if relatively standard on quite a few power supplies. The most impressive of specs is its 80+ Gold cert and its iPower Meter. Good looks and good power.